We no longer recommend using the self-tracking-entities template. It will only continue to be available to support existing applications. If your application requires working with disconnected graphs of entities, consider other alternatives such as Trackable Entities, which is a technology similar to Self-Tracking-Entities that is more actively developed by the community, or writing custom code using the low-level change tracking APIs. This walkthrough demonstrates the scenario in which a Windows Communication Foundation (WCF) service exposes an operation that returns an entity graph. Next, a client application manipulates that graph and submits the modifications to a service operation that validates and saves the updates to a database using Entity Framework. Before completing this walkthrough make sure you read the Self-Tracking Entities page. Creates a database to access. Creates a class library that contains the model. Swaps to the Self-Tracking Entity Generator template. Moves the entity classes to a separate project. Creates a WCF service that exposes operations to query and save entities. Creates client applications (Console and WPF) that consume the service. We'll use Database First in this walkthrough but the same techniques apply equally to Model First. To complete this walkthrough you will need a recent version of Visual Studio. If you are using Visual Studio 2012 then you'll be creating a LocalDB database. If you are using Visual Studio 2010 you'll be creating a SQL Express database. Let's go ahead and generate the database. First up, we need a project to put the model in. Now we need to disable the default code generation and swap to Self-Tracking Entities. To use Self-Tracking Entities our client application needs access to the entity classes generated from our model. Because we don't want to expose the whole model to the client application we're going to move the entity classes into a separate project. We're also going to make sure the entity classes get generated in the same namespace as the context. This just reduces the number of using statements we need to add throughout our application. 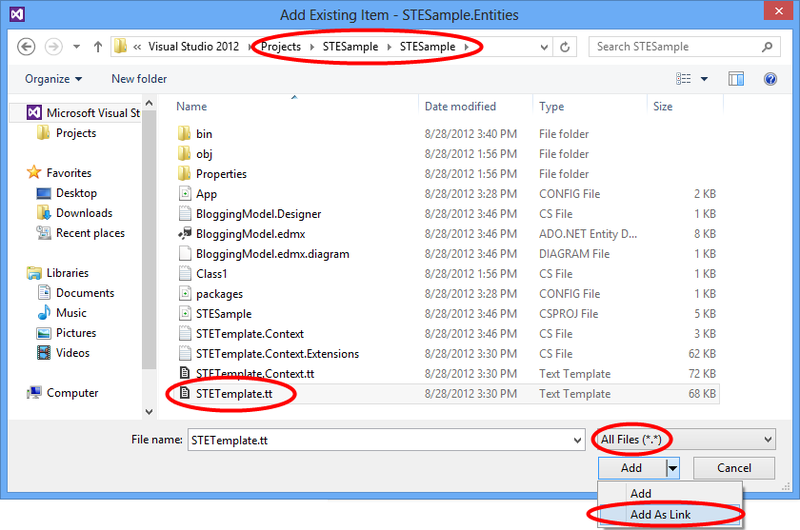 The code generated by the STE template will need a reference to System.Runtime.Serialization in order to compile. This library is needed for the WCF DataContract and DataMember attributes that are used on the serializable entity types. Finally, the project with our context in it will need a reference to the entity types. Another option for moving the entity types to a separate project is to move the template file, rather than linking it from its default location. If you do this, you will need to update the inputFile variable in the template to provide the relative path to the edmx file (in this example that would be ..\BloggingModel.edmx). Now it's time to add a WCF Service to expose our data, we'll start by creating the project. We need to copy the EF connection string to this project so that it is found at runtime. Now it's time to implement the actual service. /// Gets all the Blogs and related Posts. /// Updates Blog and its related Posts. // TODO: Perform validation on the updated order before applying the changes. // that need to be performed to reflect the changes in the database. // calls to ApplyChanges and SaveChanges should be wrapped in exception handling code. Let's create a console application that uses our service. Now we can write some code to consume the service. Open Program.cs and replace the contents with the following code. You'll see the following output when the application executes. Let's create a WPF application that uses our service. 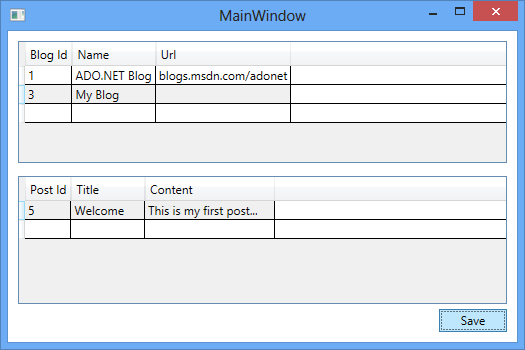 Open MainWindow.xaml and replace the contents with the following code. <Button Width="68" Height="23" HorizontalAlignment="Right" VerticalAlignment="Bottom"
// to be manipulated on the screen. // Re-query for data to get database-generated keys etc.